Luxury made to measure fitted hinged wardrobes which are made to fit your room from wall to wall and from floor to ceiling to ensure you have a bespoke design created exclusively for you. Luxury made to measure sliding bedroom doors created to give you sliding robes with various options such as mirrors, glass and timber. All made bespoke and to the exact size needed so no wasted spaces. Want a supply only quote now for luxury made to measure sliding robes then use our new design tool to get a price instantly. Delivered anywhere in the UK all made to measure to your exact specification. Luxury made to measure, bespoke home office and home studies. We make the materials to fit your space so you know that you are maximising the rooms potential. We are a specialist Bedroom and home office supply and install company based in Gomersal, Cleckheaton at 220 Oxford Road. We work in all the major cities local to our base such as Leeds, Bradford, Huddersfield, Wakefield and Halifax and can also offer made to measure sliding robes and made to measure sliding mirrored doors for you to fit yourself anywhere in the UK. We are able to offer made to measure fitted bedrooms, bespoke offices and sliding wardrobes with a very large portfolio of styles and colours to choose from. Because the units and the sliding doors are made locally we are able to offer the very best quality and service but at a realistic, affordable price. If you have been to Sharps, Sliderobes and Hammonds to name a few please speak with us before placing your order to see how much more value we can give you for your hard earned pound. If you want the very best of quality using the very best of materials and components all at a competitive rate give us a call. 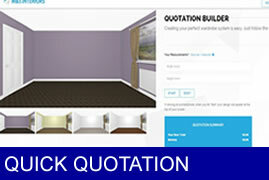 We offer a free design service and free quotations and have over 16 years experience in the home improvement market. Made to measure fitted bedroom furniture and sliding wardrobes supplied across Leeds, Bradford, Halifax, Huddersfield and Wakefield. Wow what can be said about this sliding robe project that the pictures don’t already show. An open bookshelf with vanity space for the clients to sit at. All internals fitted out in Grey Bardolino Oak to clients own specifications with a mixture of short hanging, long hanging, shelf spaces and nice wide drawers. The doors were made using 50% Grey Bardolino oak to the top with horizontal wood grain, 20% Grey mirror in the middle and 30% Grey Bardolino Oak in the bottom panel. The room is ready again for the carpets to be trimmed and refitted and the walls and ceiling to be touched back up. 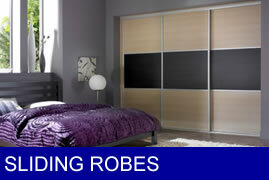 Sliding robe project for lovely clients in Queensbury. The doors were made using 50% Grey metal glass in the top panel, 20% Pure white glass in the middle and 30% Grey metal glass in the bottom. Hidden behind these 3 doors was a 60cm full length mirror on an independent track so it can be positioned anywhere along the length. The internals were all fitted out to the clients own specifications in light Grey to match the external seen elements. We also fitted some toughened glass shelves to the end with a curved front edge to soften the end panels appearance. Whilst there we used a panel to fit out the clients over-stairs cupboard. The room is all ready now for the carpets to be refitted. We now accept payment through..
Made to measure Sliding robes and made to measure sliding glass and wooden bedroom doors all with a 10 year guarantee. 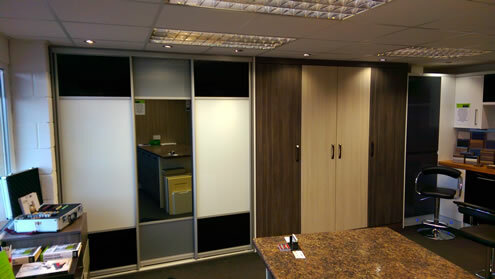 Made to measure hinged bedrooms. 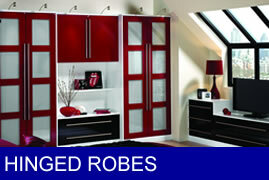 Hundreds of options all made to measure at Competitive prices. Each door can be made to your own chosen specification. Made to measure home office furniture. We have 3 designers who are able to offer free advice and have a wealth of knowledge and experience to take your own ideas and turn them into your dream bedroom or home office. We offer only the very best quality products to ensure that your investment lasts for many years to come. 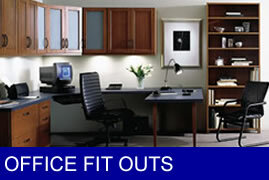 We certainly aren't the cheapest bedroom and home office company but likewise we certainly aren't the most expensive. We are however the best value made to measure bedroom furniture and fitted home office supplier and have a customer service ethos which is second to none. Thats why 85% of our work comes from recommendations, see our website for real clients thank you cards and comments. We are able to offer our fitting services within a 25 mile radius of our base at 220 Oxford Road, Gomersal, Cleckheaton, BD19 4RA and offer supply only in a similar radius of our base including Leeds, Bradford, Halifax, Huddersfield and Wakefield. 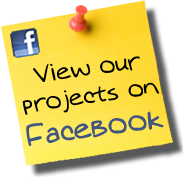 We can do made to measure, floor to ceiling and wall to wall sliding wardrobe doors anywhere in England, Wales and Scotland.